It’s my favourite time of the year – the wedding season! And while for some it spells endless shopping, numerous planning and you at your most socially active self, for us wedding photographers, it’s an entirely different buzz. 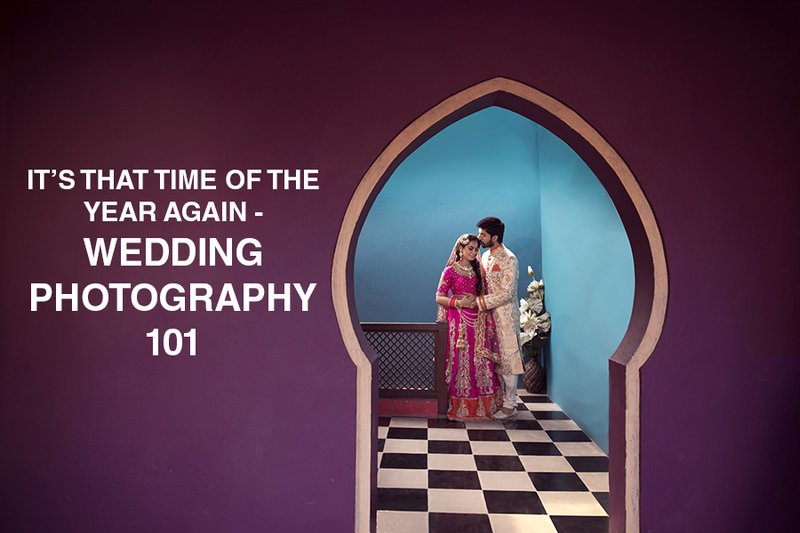 The preparation, the excitement, the hectic schedules, and the sheer number of people and their expectations that comes with each wedding – it’s a drill that comes once a year and each seasoned wedding photographer is always game for. It’s been six years and I still find myself get amazed at how one emotion finds definition in several ways with each custom. But a wedding is much more than that. With so much of time, planning, expectations and money at stake, the big day is not just for the bride and groom. And as a wedding photographer, you must know how to balance the two. Contrary to what people think, a wedding photography is more than just ‘quick-money’ projects. I meet a lot of photographers who do wedding photography as a side thing for the ‘quick bucks’ involved, but this is a rather demanding job which comes with months of prep and can require you to be on your foot for sometimes 7-8 hours at a stretch. At the end of the day, amidst all the chaos, there are people out there putting you in charge of their most precious memories. Whoa, that itself can get pretty intimidating sometimes. But a good wedding photographer, just like Batman from The Dark Knight Rises, surpasses these struggles and rises to the occasion. While closing an assignment, I always insist with my clients to do a face to face meeting (over some good snacks) instead of calls. You definitely want to understand their real expectations with their wedding photography and discuss things to the details where there would be no last minute surprises for either of you. From showing them some samples of what your ‘style’ is, deciding the ‘shot list’ for bride/groom to freezing what all be a part of the package they’re opting for, a ‘meet and chat’ is always a great idea and helps your clients get comfortable with you. Similarly, always document your project be it in terms of a contract or over emails beforehand. It not only outlines the exact deliverables for you but also makes following up pretty seamless and stress free. In my initial days, this was one tip that helped me make a speedy learning curve with wedding photography and avoid possible embarrassing situations for myself. Decide on your gear and practice some of the shots you have in mind with it in different settings, so you’re not just well-rehearsed but don’t lose any time figuring out the combinations. Over the time, this also helps you develop a signature gear for yourself which works for you. My current staple gear includes my favourite Canon 5D Mark IV, a back-up Canon 5D Mark III, Canon 24-70mm f/2.8 lens, a 100mm for ring and detail shots, a 16-35mm f/4 for wide shots and decor shots, Canon 600EX-RT 2 of them, and of course, lots OF AAA batteries. It is often said that wedding photography is 40 percent about the skills, and the whopping rest about paying attention to detail. Minute details like making a list of shots in advance or looking at how the venue has been explored by other photographers in the past, double checking if all my batteries are charged and cards formatted make a huge difference in the large scheme of things. My personal touch? I always text the bride/groom on the main day to casually check of any last minute surprises and just tell them I’d be on my way. It really helps the client calm their nerves and build a comfortable rapport to work with. Particularly helpful for those starting new, this was a clever tip I got in my early days, a tip I still use to great success. Before the event, doing a quick recce of the venue gives you an accurate idea of what scope of shots can you expect on the main day. Is it a naturally well-lit space or does it have too many corners to cover, a quick recce answers all these questions. It also helps you plan your commute well in advance and avoid losing time, so you keep your game face on. This one goes like a no brainer, but given the number of times I’ve seen a photographer landing in wearing the first thing off the rack for a wedding and causing awkward smiles, I’m going to jot this one down too. Our job may not demand any uniform, but a casual approach at dressing can easily hurt sentiments at the wedding. Your ideal scenario should be to blend in and look approachable, for you’d be interacting with hundreds of guests at the event. I know, I know. Shooting RAW takes longer processing time compared jpegs, but it saves so many of lost opportunities during your edits, that it becomes a smart investment anyway. Sometimes, it’s in the ‘didn’t make it’ category of photos that you find some wonderful detail or a candid moment captured. You get the flexibility of manipulating your captured shots which you’d have discarded otherwise, and you also save some time on the post edits for yourself. Win win! Multiple cards is the reason smart photographers are busy eating their favourite ice-cream even when the worst case scenario happens – card crash. Invest that extra five minute of prep work in this, I promise you, you won’t be disappointed. I understand why few people feel reluctant to switch to shoot off camera flash, but once you figure out the correct formula to your personal taste, this takes your couple photos up by several notches in the creativity department. From evenly lit faces to cancelling out the unnecessary backdrop, this would be your favourite toy in no time. I made the switch myself three years ago, and haven’t looked back since then. For those who are just starting out, utilising the best of real and virtual world pays off the hard work and in a shorter span of time than usual. I remember using online workshop classes such as CreativeLive, RGGEDU, Profoto, Magmod and couple others that update you on the latest gadget and make sure you are not lagging behind in technical trend departments either. Another gem is the SILK Inspire that happens in Goa every year which is a dedicated wedding photography festival. It’s a great place to network and get exposure to noted international photographers as well as trends. And if everything else sounds like too much of money/time involvement, filter on the thousands of YouTube channels easily accessible that teach all the tricks of the trade and a peek at the best gadget available. A wedding day can turn out to be more dramatic than a reality TV show sometimes, and being a wedding photographer, you have to keep your presence of mind packed along with your gear at all times. Be prepared to handle slipping situations and most of all, don’t lose your cool, and don’t hit the panic button. From the last minute weather troubles to dealing with crazy uncles, feel free to take things in charge to save the day. Handling a large party of relatives and an anxious bride/groom is no joke and the best way to handle is to be a friendly presence. The more comfortable they’re around you, the better pictures you’d get. Having said that, don’t shy away from being assertive and take calls when your work seems at stake. The key is to be approachable and resourceful, which comes particularly handy when dealing with family portraits. Beyond all said and done, last minute surprises have a life of their own and most of the time, they find a way to register for the wedding attendance. My advice? Keep calm, and make the most of what you get. While it’s a day that’s supposed to be memorable for the couple and everyone involved, often such last minute hiccups later turn to the fondest memories from the day. When life gives you them lemon, you gotta make some kickass lemonade, right? This is an amazing write-up for new photographers out there – including the relatively experienced like me. Lovely details, and I love Batman so the references worked like a charm.